1 pc. 2.20 CHF ea. from 3 pcs. 1.95 CHF ea. from 10 pcs. 1.70 CHF ea. from 20 pcs. 1.55 CHF ea. from 40 pcs. 1.45 CHF ea. The S-25-05-N is a real power pack: With an adhesive force of 8.3 kg, it is suitable for both industrial and specific applications that call for extraordinary adhesive force. 5 pcs. 0.94 CHF ea. 1 pc. 2.50 CHF ea. 5 pcs. 1.30 CHF ea. 5 pcs. 0.63 CHF ea. 1 pc. 2.85 CHF ea. 5 pcs. 0.85 CHF ea. 5 pcs. 1.17 CHF ea. 1 pc. 3.80 CHF ea. 5 pcs. 1.37 CHF ea. 1 pc. 2.10 CHF ea. 1 pc. 2.65 CHF ea. 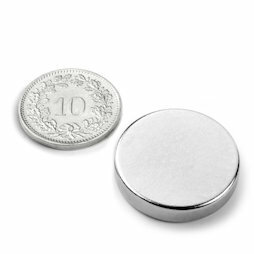 With a diameter of 25 mm and a height of 5 mm, this magnet has an aesthetic presence and can easily hold an entire magazine. Please note: Due to the high adhesive force and the low height, it is hard to detach a S-25-05-N from a magnetic metal board. Thanks to the large diameter and the high adhesive force, the S-25-05-N sticks well to magnetic paint as well. This is proof for the high adhesive force of the S-25-05-N. There is no proof, however, as to the healing power of this magnet. Industrial application: Two single wooden elements, here maple and walnut, are planed to the dimensions of 25 x 5.5 x 5.5 cm. In each element, three holes for the S-25-05-N are drilled at a depth of 8 mm. Then, the magnets as well as the wooden elements are glued together. After the profiling the whole wooden block will be oiled. The knife block stands on a MDF board with a joint that enables you to rotate the whole block, so you always have your kitchen knives handy. This is the work of an apprentice at Cabinetmaker R. Brunner AG in Zurich.